My house is anything but contemporary. Most of my clients have traditional decors, too. So the window treatment and bedding I make is also on the traditional side - lots of contrasting welt, banding, the occasional rouching or ruffle, buttons, swags and lots of pretty floral prints. The closest I usually come to a geometric are my beloved stripes - you can do wonders with a great striped fabric. One of the many great things about papercrafting is you can work with a totally different style than you usually live with or wear. You don't live with most papercraft projects every day so it is fun to experiement. Today's card uses Basic Grey's Offbeat collection - a "mod anthology" they call it. Whatever that is, it is fun and for me - a change of pace. So even if I did pull out my favorite little birdie stamp set, Cheep Talk, it gets a fresh look on these geometric prints. First, I stamped the greeting so I could get the circle in the right place. 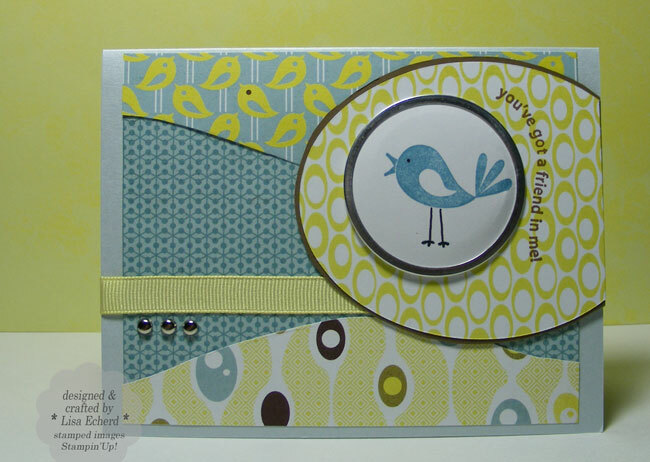 Then, the circular shape in the yellow paper around the birdie was cut with a Creative Memories oval cutter. I cut the remaining shapes by marking lightly with pencil and then free hand cutting. Next time you are paper shopping, go for something really different and give a new style a try. Cardstock: Polar Mist by Paper Studio; Soft Suede by SU!